When coming to Sydney I knew I was going to face a new challenge. It isn’t that I had never visited a country that drives on the left side of the road, but I had always taken public transport in those places. In Hong Kong, Great Britain, Hong Kong, Bahamas, Bermuda, British Virgin Islands, Grand Cayman, India, Jamaica, and Malaysia I walked, rode trains, and took taxis. Australia was different – I would need to hire a car, and so I would need to hire a car. I had actually contemplated giving it a go in Japan, but a colleague talked me out of it – and he was right. Not only would I have to remember that right is left and left is right, but I do not know the rules of the road, and I cannot read most of the road signs. Even worse I would get terribly lost very quickly – all of the road signs are in Japanese and there does not seem to be any great discernable order to the roads. So I arrived at the Sydney (Kingsford Smith) Airport after over twenty-five hours in transit (2 hours on the train from Tokyo to Narita, 2 hours at the airport, 7.5 hours to Singapore, 6 hour layover, 8 hours to Sydney) more than slightly tired. I collected my luggage and headed to the Avis counter, where the very nice lady handed me the keys to a very familiar car – a Toyota Camry, exactly the same car I drive in Canada (if newer and without all of the features). The familiarity of the vehicle would likely make my transition to the wrong side of the road easier. Putting my luggage into the trunk was easy, but that was about it… I went to get into the car, and immediately remembered that I was on the wrong side of the car. This stupid mistake would repeat itself several times over the course of the week. I walked around the car and encountered my first unexpected problem – how do I get into the car? It is weird, but combining the seat being pushed all the way forward, and the steering wheel being on the wrong side of the road, I did need to work out a system to get into the driver’s seat. Incidentally this issue would resurface when I first got into the passenger seat of a friend’s car – the steering wheel which I would usually grab onto when entering from the left was not there! I adjusted my mirrors, and checked to be sure that despite their locations under the right-side front seat it would still be my right foot operating the pedals. I put the car into gear (with my left hand… grrr!) and signaled to turn NO, sorry that’s the windshield wipers. This is another mistake I would make several times, looking stupid only when it wasn’t raining (which is to say all week). I turned on my headlights NO sorry, that’s the windshield wiper spray, so I had to sort that out. I got out of the parking lot and did very well, following a simple rule… I am not in a rush, and I was going to follow signs to the City, and to make sure I was on the correct side of the road I would follow the cars in front of me. I did very well with that strategy, and in no time at all I was proficient (if not fluent) driving on the wrong side. I got terribly lost (mostly on purpose – I was not really in a hurry to get to the hotel, and the driving around on the wrong side of the road was fun! I accidentally found myself crossing the Sydney Harbour Bridge – certainly nicer to see from below – which I suspect cost me a few dollars in tolls. After an hour or so of driving around in circles I decided to pull over and read the map, and within about 10 minutes I was at the hotel, and just as happy to get out of the car for the week-end. I would have to drive again Monday morning again, but for the time being it was time to lay me down my weary head. The most interesting issue I have had with driving in Australia has been one I hadn’t expected… it was spatial. It is easy enough to follow behind another car and not smash into anything head-on, but when I am behind the wheel of the car I am used to being flush to the left side door, with six feet of metal between myself and the right end of my lane. As I drive flush to the right side door, I find myself drifting to the left, as I see objects in my peripheral vision that look like they should be eight feet away from my body, but are in fact much less so. Fortunately this is not happening when there is a car to my left; my peripheral vision to that side has prevented that. However I have become well acquainted with the rumble strips on the side of the road. I have also somehow managed to avoid either scraping my mirrors or driving onto sidewalks… The Toyota Camry that I picked up at the airport the other day is currently on track to be returned Monday afternoon with all of its bits intact! Really when it comes down to it the only difficult job I have had to do behind the wheel is following my friend Erdal back to his place… Driving through traffic for an hour while trying to stay behind another car can be trying.in a familiar city on the right side of the road… doing so when you don’t know the city, where you are going, and you are on the wrong side of the road is quite stressful. Fortunately we were heading off to Taekwondo, where I got to work out my frustrations by kicking them away! 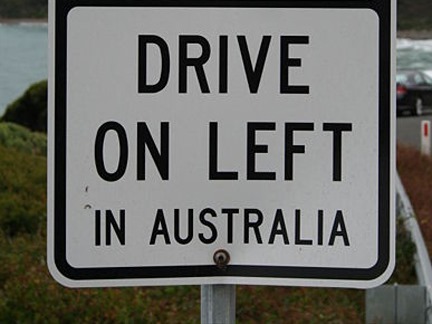 All in all Australia is not a terribly difficult place to drive, if you keep your heads about you. I am glad that I gave it a go here and did not try in Japan… I would still be driving in circles! ← Tie me Kangaroo Down, Sport! About 10 years ago I went to work in the US, and I found the same (if reversed) problems when I started driving. I discovered an interesting thing. I found that my sense of direction, which is usually pretty good, was completely turned around. I worked out it was because the sun was in the wrong place in the sky. In the southern hemisphere the sun is effectively in the north, but in the northern hemisphere it’s in the south. Once I worked that out it made it easier to work out directions, a bit like George Costanza doing the opposite of my instincts helped. The other thing was to always remember that the drivers side of the car is always in the center of the road, which made it easier turning when there were no cars to follow. Anyway enjoy your stay, how long are you here, btw? Without the mass on your right side, did you get the sensation that turning right would make you worry that it would roll over? A simple rule for vehicles built for the particular country – The driver is always closest to the centre of the road. Sometimes that rule doesn’t apply – It’s a whole new ball game. Think about how the British drive their British made vehicles in Europe. Exciting and interesting! !